Please join us for a historical talk on Saturday, 30 January, 2016 and an exhibition from 28th January to 28th March, 2016 in Kuala Lumpur. The events are organised by the Islamic Arts Museum Malaysia. Entrance is free for both events. Seats for the talk are limited; please RSVP via email to education@iamm.org.my or call 03-2270 5111/5101/5103. The Kapitan Kling Mosque is the oldest and grandest mosque in the multicultural George Town World Heritage Site, Penang. The mosque endowment (waqf) has historically provided the local Muslim community with a central urban place in the port of Penang. The mosque quarter is vibrant with the activities of both North Indian and South Indian businesses, but is especially notable for the presence of Tamil Muslims in occupations such as spice and textile traders, jewellers, money-changers, food vendors, as well as port and municipal workers. The mosque was built under the leadership of Kapitan Kling Cauder Mohuddeen, headman of the ‘Chulia’ or South Indian Muslim community. The accumulation of mosque and family religious endowments (awqaf) in nineteenth-century Penang supported religious needs, enabled Muslim families to prosper and helped to sustain the poor. In order to neutralise Muslim allegiance to the Ottoman Caliphate during the First World War, British imperial authorities using the augmented waqf income manifested their patronage of the Muslim community by sponsoring imperial oeremony, education, architecture and public space. The talk highlights the major role of the Kapitan Kling Mosque as the socio-cultural hub for the Muslims in Penang and also the diaspora of Chulia community that has transformed Penang into a melting pot for hybrid communities. 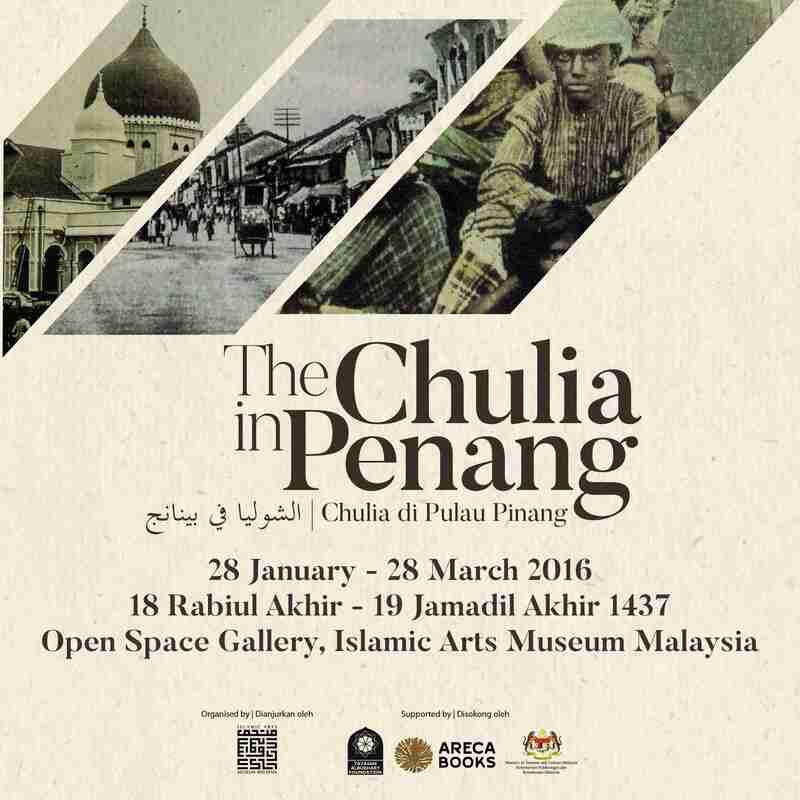 This exhibition celebrates the history of the Chulias and their contributions to the arts, culinary range, religion and socio-economy in Malaysia, particularly in Penang. Their legacy, which is still prevalent and thriving, serves as a vibrant tourist attraction. Originally from the southern part of India, the Chulias first relocated to Penang under the auspices of the East India Company where they prospered as traders of pelikat cloth, pepper and local products in the Straits of Malacca. The intermarriage with the locals has enriched the terms used from Chulia to Jawi Pekan or Peranakan (Town Muslims). The Chulias have influenced the unique history of Penang with their leading role in the development of the port town of Penang with endowments for mosques, Sufi shrines, burial grounds, a water tank, as well as holding religious feasts and processions. The construction of Kapitan Keling Mosque under the patronage of the Chulia on the endowment land area has served as the socio-cultural hub for the Muslims in Penang. 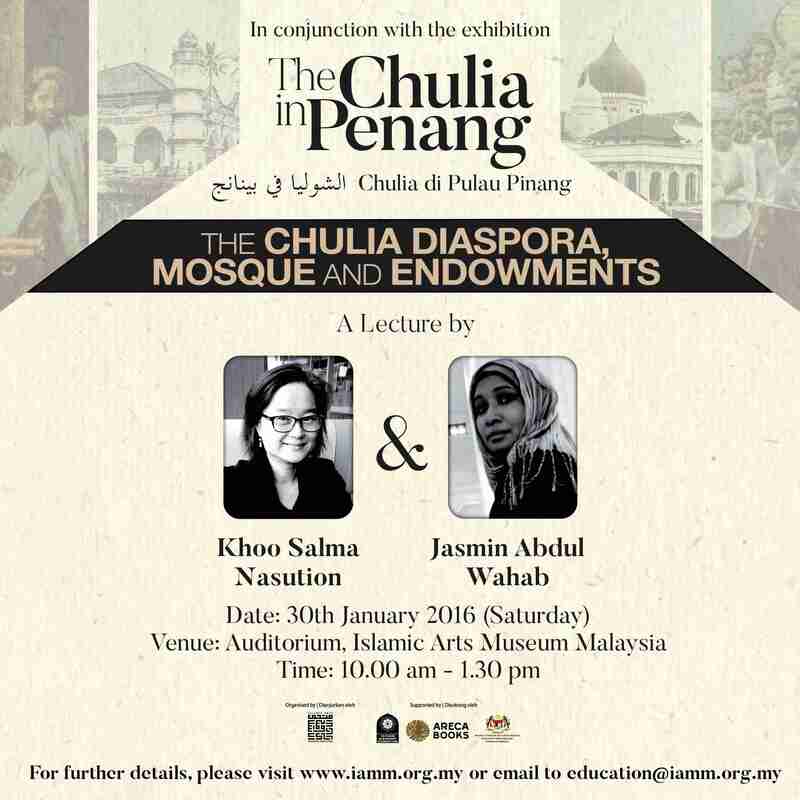 About the speakers of the historical talk on The Chulia in Penang. Khoo Salma Nasution, nee Khoo Su Nin is a writer, publisher and heritage advocate and an Asian Public Intellectual Fellow. She has been involved in heritage since 1989, first as Honorary Secretary then as President of the Penang Heritage Trust, and through her stewardship of the Sun Yat Sen Museum Penang. She is a co-founder of Areca Books. She has authored or co-authored a dozen books, such as: The Streets of George Town, Penang (1993), Kinta Valley(2005) and Redoubtable Reformer, The Life and Times of Cheah Cheang Lim (2015). Her recent book, The Chulia in Penang: Patronage and Place-Making around the Kapitan Kling Mosque 1786–1957 (2014), won the ICAS Book Prize 2015, Colleague’s Choice Award. She has given talks on the social history of the Tamil Muslims and waqf at the School of Oriental and African Studies (SOAS) in London, the International Convention for Asia Studies (ICAS) 2015 in Adelaide, the Urban Redevelopment Authority (URA) and the Indian Heritage Centre in Singapore, a symposium on the Comparative Study of Waqf at Toyo Bunko in Tokyo, and at an Indian diaspora studies conference in Kanyakumari, India. Jasmin Abdul Wahab is the director Asa’ad Entertainment Network, who has directed two public service messages for Deepavalli (2011) and Ponggal (2012). Under the heading Nambikkai, these messages in both English & Tamil for the Prime Minister’s Department, was telecasted over all the local channels and was well received and talked about. She also directed a historic documentary, Masjid Kapitan Keling (funded by Finas). The music for this documentary was by Academy Award, Grammy Award, Bafta Award, Golden Globe & Oscar Award Winner A. R. Rahman, a first time in Malaysian media.